There is cloud news and then there is cloud NEWS. At Agiliron, we have made it a habit of curating the best news stories and putting them in front of our audience. We believe, this will allow them to get a better idea of what is happening vis-à-vis the cloud. Here is a monthly list of the top cloud computing stories that businesses need to know about. This month’s column features cloud computing news from Google, Amazon, IBM and Microsoft. After acquiring the cloud monitoring service Stackdriver last May, Google announced it is working with the firm to integrate cloud application monitoring functionality into the Google Cloud Platform. Initially, the services were tested on selected alpha users. Early this year, Google announced beta availability of Google Cloud Monitoring for its Cloud Platform users. Prior to acquisition, Stackdriver offered services to AWS customers. Google announced that it will continue to offer the monitoring services irrespective of the cloud service platform used by customers. So, what does this mean for Google and Amazon customers? Companies running in Google’s cloud environment or AWS environment can leverage Cloud Monitoring services to keep track of performance, capacity and uptime of Google Apps Engine, Compute Engine and Cloud SQL. The biggest benefit with this service is that customers can receive timely security alerts when incidents occur. This will provide Google’s cloud customers a better user experience. IBM has announced ‘Identity Mixer’ a cloud based technology to help consumers better protect their private data such as date of birth, home address and credit card details. This new technology uses cryptographic algorithm that encrypts the identity attributes of users. As per this technology, only the attributes that are selected by the user are revealed to third parties. So, what does this mean for IBM customers? A consumer with this technology can make purchases online without revealing sensitive information of their credit cards like actual card number or expiration date. On the other hand, businesses too can confirm this is a valid card and will be able to accept the payment without making the potential customer add all sensitive information. This will give users control over the details that they want to reveal and businesses will be saved from the hassle of protecting customers’ sensitive information. This is a win-win situation for both. 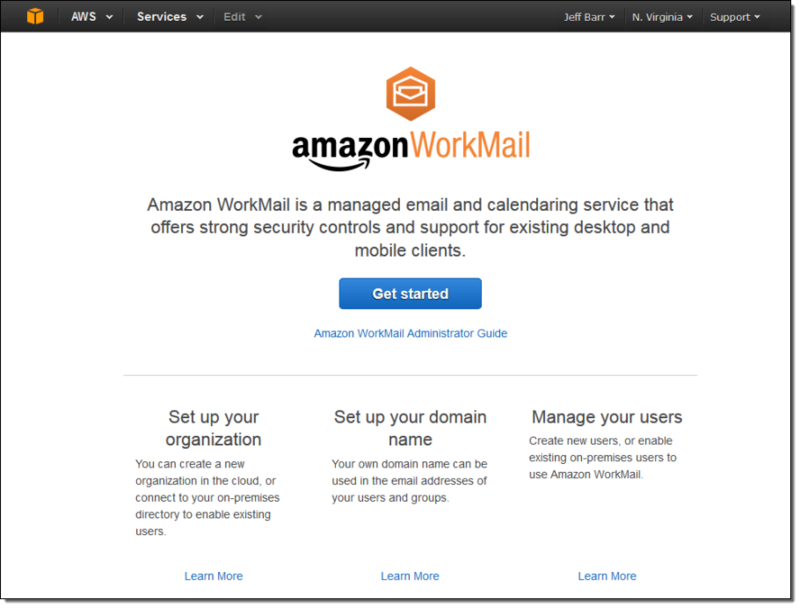 This January, Amazon announced the launch of Amazon WorkMail, a secured business email and calendaring service in the cloud. With this move, Amazon seeks to keep up with its two big rivals Microsoft and Google that are already offering this service to its customers. Amazon announced that this service is fully compatible with Microsoft Outlook. This platform is also compatible with Amazon WorkDocs, a file storage service previously known as Zocalo. So, what does this mean for consumers? The service is mainly focused at corporate customers that currently pay for Microsoft Outlook or other services. It will include features of all popular mail servers like sending and receiving emails, managing contacts, sharing calendar, etc. It will offer several benefits like security controls, privacy controls, corporate directory integration, etc. to IT administrators; to put it simply, it will deliver all the features that businesses expect from email services. Users will be able to avail the services from any device. Google and VMware announced that they would be integrating selected Google Cloud Platform services like Google Cloud Storage, Google BigQuery, Google Cloud Datastore and Google Cloud DNS into vCloud Air. As per Matthew Lodge, VMware’s vice president of cloud services, they plan to provide services by first half of this year. So, what does this mean for Google customers? This is good news for enterprises leveraging Google Cloud Platform. According to Wall Street Journal, Google’s popularity fell from 12% to 7%. So, this particular news will give enterprises a reason to trust Google. This integration will ensure that any Google cloud service will be manageable through management tools supplied by VMware. Existing vCloud Air customers will have access to new integrated services under their existing contracts and pay only for the Google services they use. This integration will prove to be a boon for both providers. Early this year, Microsoft released Azure Data Center Migration Solution which will ensure that Microsoft customers can move data between Azure data centers easily. This free open source solution is designed by Persistent Systems. Guy Bowerman, Senior Program Manager at Azure Compute Runtime said users can leverage the tool, which will provide high flexibility and extensible method of moving data between Azure data centers. So, what does this mean for Microsoft customers? This will simplify the otherwise complex task of migrating cloud assets from one Azure data center to another. With this news, Microsoft spread the much needed cheer amongst Azure customers and many of its partners. According to Microsoft, this tool will be simpler to use, customizable, field tested and optimized for performance. The solution however doesn’t solve the issue of downtime. According to a report from Synergy Research Group, Amazon reached a five-year high in the cloud market with 30% global market share in the last quarter of 2014. As per this report, Microsoft and Google made a strong surge while IBM was able to maintain its position. Microsoft holds second position after Amazon with 11% market share. Amazon Web Services (AWS) had 25% revenue growth from the third quarter to the fourth quarter of 2014. So, what does this mean for Amazon customers? As can be imagined, this means Amazon is getting its cloud services right, a fact appreciated by Amazon’s cloud customers. Share your thoughts about these stories in the comments section below.